The warm, complex aroma of a fresh-baked loaf of bread can be utterly tantalizing; the first bite, a revelation. In Bread: A Baker's Book of Techniques and Recipes, award-winning master baker Jeffrey Hamelman presents the definitive, one-stop reference on the art and science of bread baking - a kitchen essential for seasoned home bakers and professionals alike. Hamelman, a professional baker for nearly three decades, was a member of the United States national baking team that won first place in the 1996 Coupe du Monde de la Boulangerie, the bread-baking World Cup. Here, he shares this experience, putting world-class artisanal loaves within reach of any serious baker. Opening with a comprehensive overview of the foundations - essential ingredients; hand techniques for kneading, scoring, and shaping; the basic process from mixing through baking - he lucidly guides bakers through all elements of this richly rewarding craft. Bread contains 118 detailed, step-by-step recipes for an array of breads: versatile sourdough ryes; breads made with pre-ferments; and simple, straight dough loaves. Recipes for brioche, focaccia, pizza dough, flat breads, and other traditional baking staples augment the diverse collection of flavors, tastes, and textures represented within these pages. From the delicate flavor and aroma of classic French baguettes to the mellow smoothness of Roasted Garlic Levain, a bread for every season and every palate is here. Each recipe clearly outlines the key stages, with easy-to-use charts that list ingredients in both American and metric measures, quantities appropriate for home baking, and baker's percentages. Hundreds of drawings vividly illustrate techniques, and 35 handsome color photographs display finished breads. Sidebars accompany each recipe and section with valuable tips, from the subtle art of tasting and evaluating breads to the perfect fare to complement Vollkornbrot. A complete chapter on decorative breads - with instructions on techniques as well as a wide variety of exquisite patterns - will inspire magnificent display creations. Laced throughout the book, Hamelman's personal narratives offer a compelling portrait of a lifelong love affair with bread and vividly communicate this passion. For bakers seeking to finesse this time-honored craft or simply to learn the tricks of the trade from a real master, Bread is a resource to be consulted time and time again. The warm, complex aroma of a fresh-baked loaf of bread can be utterly tantalizing; the first bite, a revelation. In Bread: A Baker's Book of Techniques and Recipes, award-winning master baker Jeffrey Hamelman presents the definitive, one-stop reference on the art and science of bread baking--a kitchen essential for seasoned home bakers and professionals alike.Hamelman, a professional baker for nearly three decades, was a member of Baking Team USA, which represents the United States in the international Coupe du Monde de la Boulangerie, the bread-baking World Cup. Here, he shares this experience, putting world-class artisanal loaves within reach of any serious baker. Opening with a comprehensive overview of the foundations--essential ingredients; hand techniques for kneading, scoring, and shaping; the basic process from mixing through baking--he lucidly guides bakers through all elements of this richly rewarding craft.Bread contains 118 detailed, step-by-step recipes for an array of breads--versatile sourdough ryes; numerous breads made with pre-ferments; and simple, straight dough loaves. Recipes for brioche, focaccia, pizza dough, flat breads, and other traditional baking staples augment the diverse collection of flavors, tastes, and textures represented within these pages. From the delicate flavor and aroma of classic French baguettes to the mellow smoothness of Roasted Garlic Levain, a bread for every season and every palate is here.Each recipe clearly outlines the key stages, with easy-to-use charts that list ingredients in both American and metric measures, quantities appropriate for home baking, and baker's percentages. Hundreds of drawings vividly illustrate techniques, and 35 handsome color photographs display finished breads. Sidebars accompany each recipe and section with valuable tips, from the subtle art of tasting and evaluating breads to the perfect fare to complement Vollkornbrot. A complete chapter on decorative breads--with instructions on techniques as well as a wide variety of exquisite patterns--will inspire magnificent display creations.Laced throughout the book, Hamelman's personal narratives offer a compelling portrait of a lifelong love affair with bread and vividly communicate this passion. For bakers seeking to finesse this time-honored craft or simply to learn the tricks of the trade from a real master, Bread is a resource to be consulted time and time again. CHIHO KANEKO is a fine artist whose work has been exhibited both in the United States and Japan. She also works as a translator and interpreter. She is a native of Japan with a background in landscape architecture, agronomy, and art. "It was a most agreeable surprise to find that such a book exists in English, and I find it most difficult to adequately express the joy that this has brought me. I see something of myself in these pages, and often, a better version of myself. 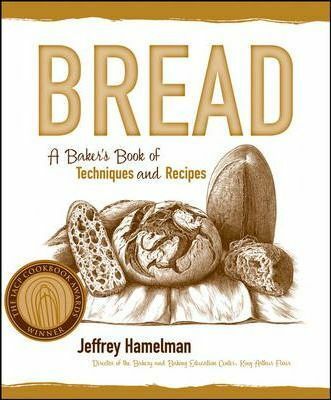 I can only hope that those whose mission it is to make good bread seize the opportunity to read Jeffrey Hamelman's book, heed his advice, and adopt his methods with due care and respect." --Raymond Calvel"With this work, Jeffrey Hamelman will increase professional bakers' knowledge and savoir faire. Its approach to research and quality is a revelation. The book combines technique with quality, and I am convinced that it will become a benchmark reference work on artisanal baking." --Christian Vabret"What a wonderful book! It's sure to become the definitive guide for professional and home bakers alike. Jeffrey Hamelman's voice as a seasoned baker and teacher makes the technical information clear and easy to understand." --Amy Scherber owner of Amy's Bread, New York City"Bravo to Jeffrey Hamelman! Bread: A Baker's Book of Techniques and recipes is the new classic for serious home bakers and professionals. Jeffrey has melded accurate and detailed technical information and a comprehensive array of artisan bread formulas with short essays that capture his passion and appreciation for his craft. Chiho Kaneko's exquisite line drawings complete the book, bringing to the pages a sense of handcraft and the simple beauty of Jeffrey's breads." Recipes. Acknowledgments. Foreword by Raymond Calvel. Preface. PART ONE: INGREDIENTS AND TECHNIQUES. 1. The Bread-Making Process from Mixing through Baking. 2. Ingredients and their Function. 3. Hand Techniques. PART TWO: FORMULAS AND DECORATIVE BREADS. 4. Breads Made with Yeasted Pre-Ferments. 5. Levain Breads. 6. Sourdough Rye Breads. 7. Straight Doughs. 8. Miscellaneous Breads. 9. Braiding Techniques. 10. Decorative and Display Projects. Appendix. Developing and Perpetuating a Sourdough Culture. Rheological Testing and Analysis of Flour. Flour Additives. Baker's Percentage. Desired Dough Temperature. Computing Batch Cost. Useful Conversions and Equivalencies. Sample Proofing Schedule. Epilogue. Glossary. Bibliography. Index. About the Author. JEFFREY HAMELMAN has been baking professionally for nearly thirty years. For half that time he owned a bakery in Vermont. He has served as a baking and pastry instructor at several culinary schools and has baked and taught in France, Germany, Canada, Ireland, Brazil, and Japan. In 1996, he was selected as Captain of Baking Team USA, the three-person team that represented the United States in Paris at the Coupe du Monde de la Boulangerie - the World Cup of Baking. In 1998, he became the 76th Certified Master Baker in the United States. He is Director of the Bakery and Baking Education Center at the King Arthur Flour Company in Norwich, Vermont. In this capacity, he teaches professional baking classes one week each month and bakes for three weeks each month in King Arthur's production bakery.